Fighter of Kiev junta’s punitive operation in Donbass did shooting in the house of his wife’s parents, according to Head Department of the National Police in Ternopol region, Ukrainian media reported on March 4th. 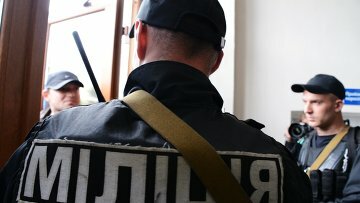 On the morning of March 4th, in Petrikov village near Ternopol, a 55 year-old man, who returned from the zone of Kiev junta’s punitive operation (so-called, “antiterrorist operation” − Editor), found his wife with another man, threw a grenade into the house, and opened fire from a smooth-bore hunting gun. Сohabiter of perpetrator’s wife was taken to the intensive care with a gunshot wound to the shoulder. When police arrived to the crime scene, the jealous husband took 81-year-old pensioner hostage and barricaded himself in the house. Special Forces unit “Sokol” of Ternopol police was tasked with the release of the hostage. In the course of the operation, the perpetrator blew up himself and the hostage with a grenade. Reports about shootings involving soldiers from the zone of Kiev junta’s punitive operation appear regularly. On March 2nd in Kharkov, a man with a gun in the uniform of the Ukrainian army put three schoolchildren to their knees, fired into the ground and threatened them with death.